If you are new to KatersAcres, welcome to the clay FUN ZONE! If you are not new to KatersAcres, welcome back. My goal with everything that I do here on the website is to make polymer clay engaging, fun, and accessible to everyone. You don’t need to be a professional artist to use this versatile medium. One of the new things I’m doing in 2016 is choosing one polymer clay book of the month to share with you. These books may be brand new, like January’s “Dogs” Book by Christi Friesen, or older and well loved, like this month’s Images on Clay series by Barbara McGuire. Barbara’s work is fun, colorful, and showcases a wide variety of techniques. Every month here on the site we are choosing one polymer clay tutorial of the month and one polymer clay book of the month. This month’s polymer clay book of the month is none other Barbara McGuire’s Images on Clay and Images on Clay II. Barbara McGuire is no stranger to the polymer clay world. She has been creating and teaching for many many years. She is passionate about polymer clay and teaching her techniques and styles to others and new generations of clayers as well. In fact, Barbara McGuire is once again teaching at the very popular Polymer Clay Adventure. I loved her class last year and I know this year’s will be just as awesome with her Ultralight Radial Pendants class. Be sure to come join us. As I have stated before, polymer clay is one of the most versatile mediums on the planet, at least in my opinion. There is so much that you can do with it that people of many different artistic backgrounds fall in love with it’s simplicity and possibilities. 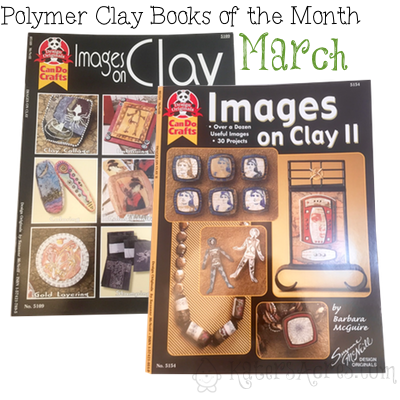 Our first polymer clay book of the month is “Images on Clay” by Nan Roche, Gwen Gibson, Dayle Doroshow, & Barbara McGuire. If you have never worked with images transfers or placing images onto clay this is a must have book. This book was published in 2000 but is still a breakthrough book showing how to make, use, and design items with images of many different kinds. Polymer Clay Book Review: Images on Clay II? This book, Images on Clay II, was published in 2002 as a continuation in idea & theme from the first book. Both books are unique and inspirational. This book includes images that you can photocopy and use yourself, something that the first book does not do. This book also has a wider variety of projects that the first. One of my absolute favorites in the book is: Map Panel, Ancient Images, & Transfer Portrait Painting. While the first book focused more so on the jewelry aspect of polymer clay, this book ties the idea of images on clay into multiple projects from wall decor, beads, focal beads, wall hangings, and two doll projects two. All links to purchase these books go to Amazon where I am an affiliate and get a tiny commission for each purchase of the item. Katie – Thanks for reviewing my books! It’s ‘Back to the Future’ as Images on Clay was the first book to introduce ‘stamping’ in polymer clay (honestly!). I worked for the FIMO distributor at the time and it was a ‘new’ concept to the stamping world. Suzanne (the publisher) didn’t think you could write a whole book on just ‘stamping’ so that’s why there are so many techniques – such as mokume gane, and transfers and pencils…..included in the book. It is one of the very few times Gwen Gibson’s tear-away technique was ever published. I should point out the tear-away technique only works with ‘old’ Sculpey – they have since changed the formula. And since that time – stamping on clay has become widely enjoyed. The second book was written to help illustrate how to use the Shapelets templates that I had designed for Polyform. The repetitive borders work with any type of shapes. Now I make rubbers stamps in shapes instead of templates. I also make textures – which I’d love to see in your sculptures! I’d be happy to share the results of someone using the books – in their work. Transfers and textures are a great way to enhance designs and details. Thanks so much for the lovely review and I look forward to seeing you at the retreat!